Mornings are the most structured part of Eliot. After breakfast there is an all-camp ingathering with a short worship and music program for all ages. After the ingathering, children and youth go to their programs. In Winter, youth may be included in the adult program instead of meeting separately. Each morning at July, August, and Winter Eliot, the theme speaker will present their program for the adults, followed by a short break for coffee and then Morning Discussion Groups. You will be assigned to a small discussion group which will meet each morning of the camp session. It is a chance to explore in more depth the program themes. Your group facilitator will help direct the discussion. These groups are a great opportunity to open up and really get to know others in our community. In order to encourage a broad, inclusive experience for all, Eliot Institute strives for breadth and balance in our small groupings. We arrange small groups so that we achieve a gender, age and geographical spread, as well as placing people outside of family and congregational groupings as much as possible. This helps us to form new connections. At Creative Arts Eliot, each camper, age 10 and older will select one workshop to participate in. Workshops meet each morning, and ther may be afternoon "open studios" for campers to see what's happening in other workshops. A children's program is provided for campers younger than age 10. After lunch you can rest, play, swim (in summer) or get involved in all kinds of creative, artistic ventures. Most afternoon activities are organized by volunteers. Please respond to the calls for volunteers. It's a great way to meet people and to help make this a wonderful experience for all. Evenings are filled with multigenerational activities, games, and worship. A concert, talent show, dance and coffeehouse are often scheduled. Eliot Institute strives to engage and learn from our differences, spiritually, politically and socially in an atmosphere of mutual respect. Roasts, teasing and personal attacks may damage mutual respect. Satire and humor at Eliot needs to be done in a respectful and loving manner: any public reference involving satire must emphasize content, not personality. We do not make fun of our invited guest speakers. The Talent Show Coordinator for each camp is responsible for communicating this to all players. 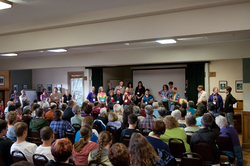 August Eliot 2019 "Shaping Unitarian Universalism into a Multicultural Faith" with Rev. Meg Riley, in collaboration with Aisha Hauser. ==> Eliot is magical. Caring people, love, music, intimacy, children and adults together. What more could anybody want?